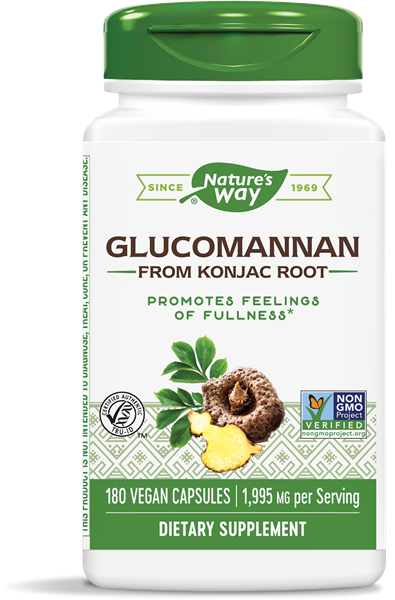 Glucomannan / 180 Vcaps - Nature's Way®. Take 3 capsules with at least 8 oz of water (a full glass) approximately 20 minutes before mealtime. Take this product with at least a full glass of water. Taking this product without adequate fluid may cause it to swell and block your throat or esophagus and may cause choking. Do not take this product if you have difficulty swallowing. If you experience chest pain, vomiting or difficulty swallowing or breathing after taking this product, seek immediate medical attention. If pregnant, nursing or taking any medications, consult a healthcare professional before use.